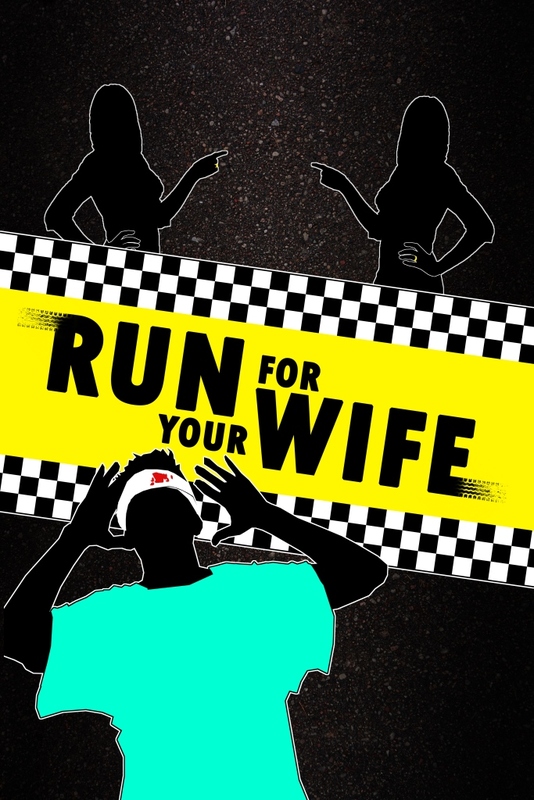 Morpheus Theatre is pleased to announce the cast of our 22nd season opener – Run For Your Wife. Presenting Morpheus Theatre’s 2016/2017 Season! Join us for our TWENTY-SECOND SEASON of Shows Worth Seeing. Click the link to Download the Season Ticket Brochure (0.5 mb file). Show times are Wednesday to Saturday at 7:30pm. Weekend matinees are at 2:00pm. John Smith is a man with a schedule and a secret. The schedule is not just to keep him on time in his job driving a taxi, it also keeps his life—his lives, rather—organized and in their places. You see, it’s important to be organized when one has two of everything. Yes, everything. Two separate lives in two different houses in two different areas of London, with two different wives! When John is mugged, he finds himself coming home from the hospital surrounded by wives and policemen, all asking for an explanation. 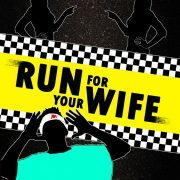 Run For Your Wife has been bringing laughter to audiences for many years. Join us this September when it brings the laughter to you! Based on the classic film by Frank Capra, It’s A Wonderful Life has been delighting audiences on the silver screen and in theatres since it debuted in 1943. December just doesn’t seem complete without a trip to Bedford Falls and the story of George Bailey, a man who believes in building community and helping your neighbours. 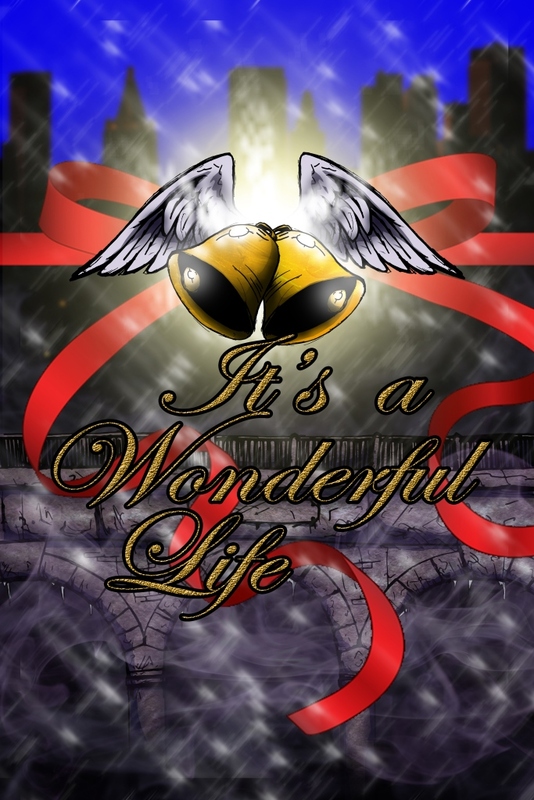 When he becomes overwhelmed by one misfortune after another, George almost gives in to despair and then, on Christmas Eve, he meets a special angel on a mission to help George and receive his wings. The timeless message of hope, love and charity is especially warming on winter evenings with family and friends close-by. We hope you and yours will come celebrate this classic piece and this special time with us. For our Pantomime fans, we will be returning to the genre in 2017. What do you do when all the money is gone? When there’s no jobs in sight, the family home still isn’t paid off and the bills just keep coming, how can one survive in a society that requires capital? When Rollie and Daphne Waters are faced with just such a situation, they decide it is time to get creative…and a little risqué. Okay, a lot risqué. But it would be fairly easy, after all, their friend Alex has a camera, he’s a professional cameraman and he just lost his job too! Daphne is a writer, Rollie can get the costumes…it’s a cash cow! And besides, it’s not like the designer dress can be returned, so what choice do they have, really? It could be romantic, really—a young love story, with Italian bakeries and nine grain baguettes! Come enjoy a laugh with us in these troubling economic times, it’s in the stars! In honour of Canada’s 150th year, we are presenting this comedy by renowned Canadian playwright Norm Foster. Love. So beautiful. So musical. So complicated. 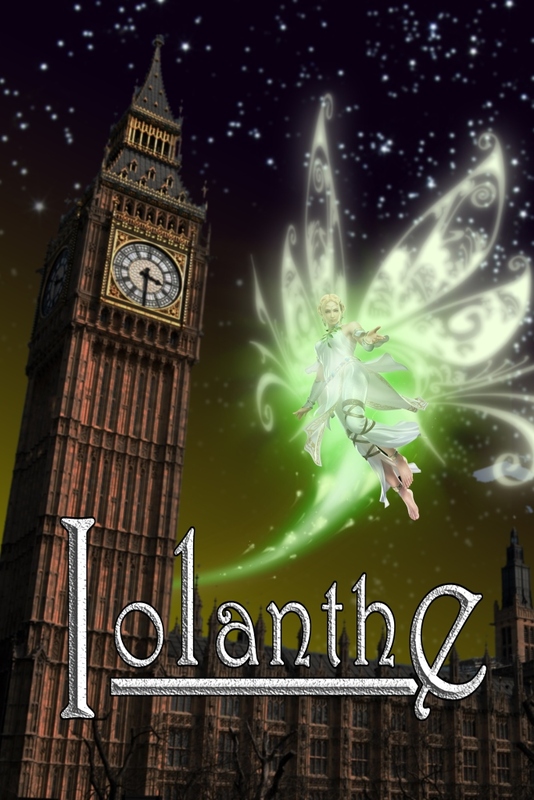 Although forbidden by fairy law, Iolanthe marries a mortal and is then banished from fairyland. Here in our human world, she bears a son; a lovely lad named Strephon, who falls head over heels and wants to marry Phyllis, who is, of course, desired by all the members of the House of Peers. When Phyllis sees Strephon embrace Iolanthe, who is ethereal and lovely, she doesn’t stop for one moment to consider she might be Strephon’s mother and sets in motion a musical clash between politicians and fairies, sending everyone tripping hither, tripping thither – we did mention love can be complicated – it’s an energetic, satirical journey to the finale. Off and away to get your tickets! We’ll see you in Spring for this, the seventh of fourteen collaborations by W.S. Gilbert and Arthur Sullivan. Two of our Sister Companies are partnering up for Musical Theatre & Choral Summer Camps! Naomi Williams, who has just moved AvidDiva Vocal Studio to Morpheus Rehearsal Centre, and Angela Woodard, who has been running Star Street Studios out of our space are teaming up to offer SUMMER CAMPS at our home in Parkdale! Accomplished Instructors + Affordable Prices = Awesome Fun! These camps are geared to beginning or just-beginning students who want to try out singing or musical theatre. All camps are located at the Morpheus Rehearsal Centre in the Parkdale neighbourhood of Calgary (3512 5th Ave NW), and are run by working professionals in the performing arts. 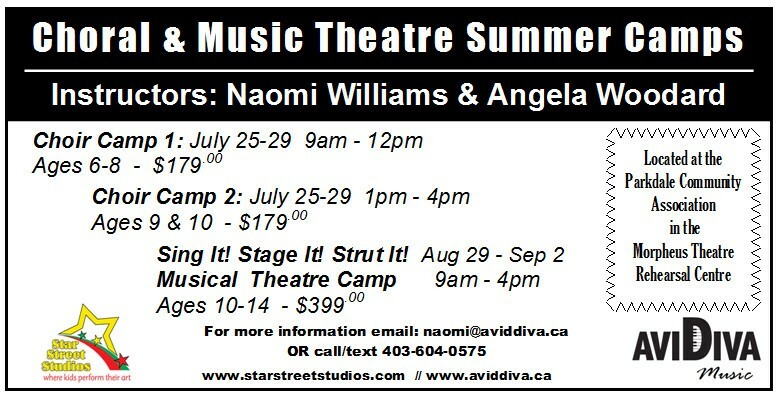 You can check out their websites at www.aviddiva.ca (Naomi) and www.starstreetstudios.com (Angela Woodard).